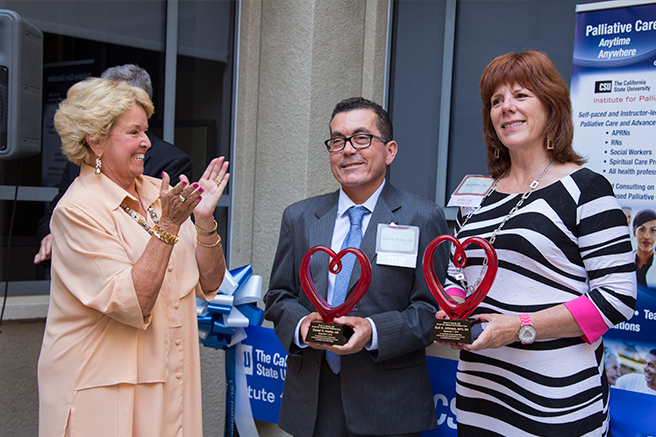 On September 7th, the Institute held a community gathering and ribbon-cutting ceremony to celebrate the new headquarters of the California State University Institute for Palliative Care. Truly a milestone celebration of the four years of the Institute’s success. Pictured Left to Right: Helen McNeal, Darlene Marcos Shiley, and CSUSM President Karen Haynes. CSU Institute for Palliative Care Executive Director Helen McNeal reflected on the Institute’s accomplishments in her remarks. CSU San Marcos President Karen S. Haynes, Ph.D., also addressed the gathering, noting not only the significant achievements of the Institute in a short period of time, but also the great need for the Institute’s work. – President Karen S. Haynes, Ph.D. 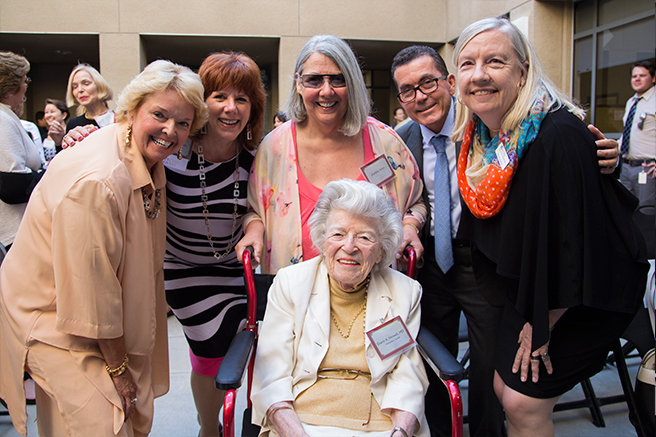 The inaugural Doris A. Howell MD Award for Advancing Palliative Care was established by the Institute to honor the leadership of professionals who help others suffering from serious or chronic illness to optimize the quality of their life by anticipating, preventing and managing suffering. Pictured Left to Right to Bottom: CSUSM President Karen Haynes, Suzi K. Johnson, Darlene Marcos Shiley, Dr. Daniel Hoefer, Helen McNeal, and Dr. Doris A. Howell. CSUSM President Karen Haynes (Left) Bestows Awards on Dr. Daniel Hoefer (Middle) and Suzi K. Johnson (Right). “Together, Dan and Suzi have been instrumental in Sharp’s leading edge work in incorporating palliative care across Sharp and in advancing the care of those with serious and chronic illness in San Diego and nationally,” McNeal said as she invited President Haynes to bestow the awards to Hoefer and Johnson. The Institute was presented with a State Assembly Resolution on behalf of Assemblymember Marie Waldron of the 75th Assembly District. Additionally, U.S. Rep. Susan Davis also recognized the Institute by providing the Institute with a Certificate of Special Congressional Recognition. President Haynes and Darlene Marcos Shiley, Institute benefactor, wielded the giant scissors to officially open the Institute’s new headquarters. 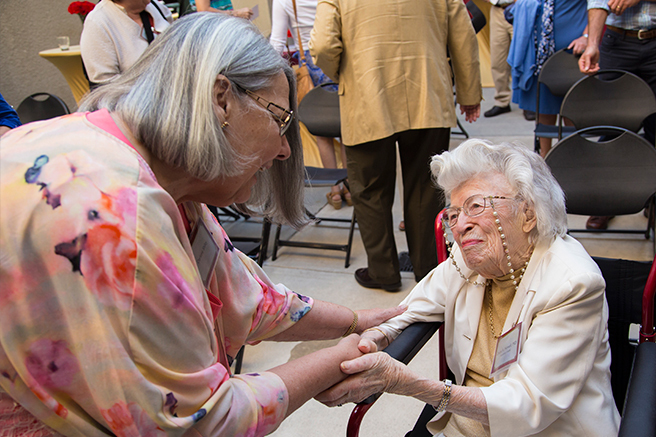 Darlene Marcos Shiley (Left) warmly greets honored guest, Dr. Doris Howell (Right). The CSU Institute for Palliative Care, located at Cal State San Marcos, is charged with positively impacting the critical shortage of nursing, physician, social work, spiritual and other professionals with palliative care skills and training. Now in its fourth year since its launch in September 2012, the institute offers 49 courses with 46 new courses under development. The Institute has eight campus partners, has trained over 3,200 health care professionals and, through its partner campuses, has educated over 6,690 community members about palliative care.